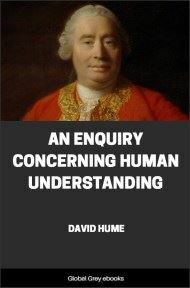 An Enquiry Concerning Human Understanding is a book by the Scottish empiricist philosopher David Hume, published in English in 1748. It was a revision of an earlier effort, Hume's A Treatise of Human Nature, published anonymously in London in 1739–40. The argument of the Enquiry proceeds by a series of incremental steps, separated into chapters which logically succeed one another. After expounding his epistemology, Hume explains how to apply his principles to specific topics.